Bulimia Nervosa: What is it, Symptoms, and Treatments. Bulimia nervosa is more common than anorexia nervosa, and is often characterized by uncontrollable binge eating, followed by self-induced purging (by vomiting or using laxatives). Most people with bulimia are of normal weight, or close to normal weight for their height and age. For this reason, and the fact that most people with bulimia hide their binge eating and purging from others, it may be difficult to know if someone has bulimia. People with bulimia often struggle with self-esteem, self-worth, and confidence. Their body weight is strongly tied to feelings of self-worth. 90% of individuals with bulimia are women, and their weight is a major factor in their level of self-esteem, making treatment so important. In addition, after binging and purging, the person may feel ashamed or depressed. Oftentimes, symptoms of anxiety and/or depression accompany bulimia. 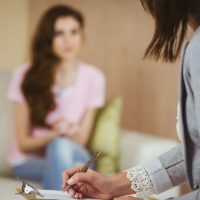 Dalton Associates can help you find the right mental health professional for the treatment of bulimia. They may use Cognitive Behavioural Therapy, or a combination of therapies, to effectively help you reduce or eliminate thoughts that lead to the cycle of binge eating and purging. Treatment will also involve treating the psychological issues behind the development of the disorder.